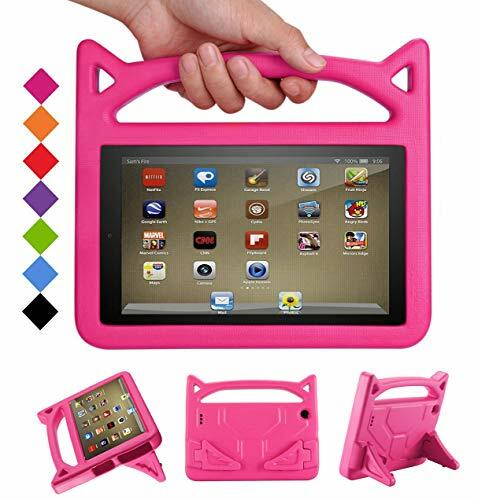 This case is designed for A m a z o n F i r e 7 Tablet (7" Display 5th Generation - 2015 release & 7th generation - 2017 release) ONLY.Do not fit for other Tablet. -This case is designed for kids,cute and smart,your kids will love it. -Made of durable EVA foam rubberEVA.Soft, squishy material is fun and safe for children. - The design of handle is for easy handling and carrying around from school to home or traveling. -The just right view angle, release your hands,ease and comfortable. Slipery edges do not hurt the hand, delicate and comfortable feel, give you a smooth and convenient experience. - Cut out and openings for buttons controls and cameras, manipulation with high proficiency. - The design of bulging cushion edge, effective shock proof, even if the equipment accidentally fall, it can also play a protective role. - Fashion finished look with various colors for kids case. - Child drop proof kids F i r e HD 7 case, simply snap-on design that is easy to install and take off. SHOCKPROOF - Thick foam fully covers the back, sides and extends above the surface of the F i r e 7 2015/2017 Tablet which means that the screen will remain safe from scratches if laid on its face. Made with dense heavy duty EVA foam, the same kind that is used in the soles of high end sneakers. Material can withstand considerable wear and tear and provide extreme shock protection. WARRANTY: 1-YEAR WORRY-FREE GUARANTEE,100% Money Back- If they are broken, return it and we'll replace it for free. If you have any questions about this product by Bromee, contact us by completing and submitting the form below. If you are looking for a specif part number, please include it with your message.